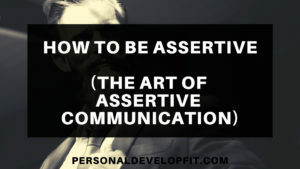 When it comes to how to be assertive, there are some great tips that we can use to master this style of communication. When done properly, can communicate effectively, efficiently and boldly. But what are these tips that we can use that can help us master this style of communication? 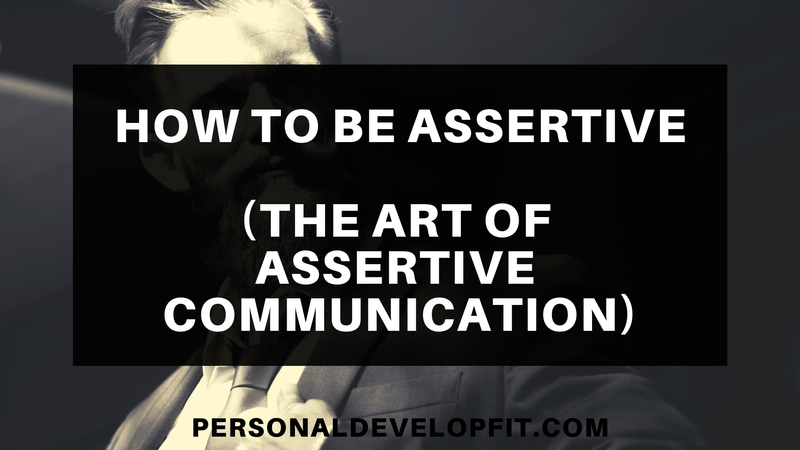 Below I get into the exact tips of how to master assertive communication, along with some quick examples of the other styles of communication so we can gain perspective all of the different ways people communicate. To help us better lean towards and master assertiveness. in order to really get a feel for what assertive communication is, we need to know about all the styles of communication that are use. So we can see what assertive communication is NOT. When we see what it isn’t we can get a better sense for what it truly is. This style of communication is when we avoid what we want to say. We are shifty and avoid good eye contact. It is a form of social anxiety disorder and hinder ones daily life. If is a form of communication that lacks opinion sharing. It fails to protect your rights along with share your needs and get them met. Often times, this style of communication is referred to “beating around the bush”. They let other people dictate the flow of the conversation and are quick to apologize. They speak softly and often have a slumped posture. This person straddles the line between aggressive and passive communication. Needs and feelings are not expressed and our own personal rights are ignored. This style of communication often leads to built up feels of anger and resentment but are more repressed than expressed. The person often wants the other person to make the decision in order to avoid getting into a verbal or physical fight. This is the type of person that wants to win at all costs during conversing. This style of communication is more emotionally charged and either consciously or subconsciously desires to damage other self esteem. There is little consideration for others feelings and a lack of empathy permeates their style of communication. The result of an aggressive communicator is that they make others feel disrespected along with triggers a feel of aggression in others. They build walls and are quick to ultimately their communication style leads them to negative interactions. This can be seen as more scheming in the way this person operates. A cunning style to where the person is more calculated. With manipulative communication, there is usually some sort of hidden agent or underlying message. Often times the person on the other end isn’t even aware of the hidden agenda. The persons main goal is to make others feel sorry for them or obligated to meet their needs. They aren’t direct in asking for their needs to be met, it is done in a more indirect way. Ding Ding! This is what all the build up has lead us to! The style of communication in which we want to communicate. Why? Because it is the most effective form of communication known to man. There is no sarcasm and the person is not trying to threaten someone into agreeing or influencing the other. It doesn’t violate the rights of the other person. It shows respect and is done in the most honest way possible. When it comes down to it, assertive communication is the best form of communication that you can use. It is the most healthy form of communication as well, for our physical and mental along with emotional health. The chances of getting what you want out of live go up exponentially because you are letting others know what you need along with how you are feeling. In my experience it is also just way more productive. You get everything on the table and you don’t leave anything to be discussed later. Which often happens when you hold back what you want to say in order to save face or not hurt someone’s feelings. It also clears the air of any negative emotion afterwards. Both parties feel as if they have vented in a way and no longer harbor negative feelings. Both parties have satisfied the need to express themselves. Which is a deep seeded need for all of us to do. It is the opposite of suppression and is so healthy for ourselves and building healthy relationships. First off the thing that you and I need to do first in order to become assertive in the way we communicate and act is to simply decide that we are going to be. That no matter how weird it feels, that we will push through those feels. That we are worth enough and have enough belief in ourselves to be assertive in the way we act. We need to know that we are worth standing up for. No one is going to do it. And if we don’t become assertive in our ways, we will get walked all over. People will respect us more when we are being assertive because we are grounded and what we believe. Even if the other person doesn’t believe the same thing. It is having the courage to speak your mind and heart and then allow the other person to do the same. Make a mental note to yourself that you do and will value assertive communication over not doing so. Otherwise you and I will always default back to lack of assertive communication. One of the biggest facts that plays into being assertive is to be authentic and truthful. Because if we have even a hint of white lie, then we cannot directly communicate. If we can’t directly communicate, we lose are ability to look and be assertive. So even if it is tough, tell the truth at all costs when using assertive communication. This truth is your truth. It is similar to a child that shows and tells his needs blatantly. Like when a child screams out that he is hungry and wants food now! This is a great example of assertive communication. Of course it is coming from a child’s state of awareness which is more eraddic and explosive. But it is a good lesson we can learn from. Whatever is on our mind, state it. If we try to dance around what we are thinking in order to deliver it in a way that is less offensive or ina way that makes us look less aggressive, we can never be assertive. One of the best ways to be assertive is to stand your ground. I am not saying let your pride get the best of you and never budge from your opinions. I am just saying that when you state your opinion, stand by it. Don’t be swayed towards agreeing with someone just to make it less awkward or less tense. Assertiveness is believing in what you believe and sticking to it when you say it. Of courage be open to hearing other peoples points of view. But sticking to yours will make you look solidly grounded in your beliefs and people will see you as assertive because of this. When speaking our truths, often times we will want to compete and win with our side of the argument. But being assertive is never about proving anyone wrong. Or winning out over someone when you are communicating. It is about getting your side of the story out with coloring it with emotions or opinions that are not beneficial to the others persons well being and self esteem. This is not about tearing someone down at all. The biggest block in how to be assertive with people is our need and desire to be approved of by others. We want to feel the safety that comes from being more agreeable with people. But this gets in the way of authentic and assertive communication. The first couple time when you are communicating and trying to be assertive, push past the fear of not being liked by someone. It will get easier as you keep doing so. Not everyone is going to see eye to eye. And when we try to do and say things to get other people to like, we lose ourselves and become shaky in the way we communicate. When we say what we are feeling, we are able to stay on a clear path to the goal of expressing ourselves. Instead of trying to weave and wiggle through conversations. It allows us to communicate FASTER which proof that your are communicating in an assertive way. Which brings me to my next point. People are more tough than we think. Honestly, at the end of the day ask you self how you would like to be communicated with. Would you rather have someone give it to you straight? Or would you rather have someone beat around the bush and take forever to get to the point out of fear of offending you? The first one right? So why not give that person the same courtesy from here on out? Lets do it! We need to do our best to not banter on our use filler words. Proper communication is done by getting to the point as quickly as possible. No beating around the bush. Keeping conversation simple allows you to communicate more readily and directly. Along with allowing the other party to feel that sense of assertiveness. As you are providing the information to them in bite size pieces that can be consumed and easily digested. As assertive communication is just as much about having the other person understand what you are saying in order to be influenced by it. This can be as simple as saying NO and standing your ground. If you don’t want to do something, express it and don’t let there be any other option. Tell people how it is and how it is affecting you or them. It is really that simple. Refrain from judgemental comments that are going to hurt the other person. Assertive communication is not about this. It is simply about getting to facts laid out on the table to that they can be dealt with. When emotions come into play, the conversation is going to go in every direction but the direction you want it to go in. It also shows that you are mature and want to deal with the root cause of how you are feeling. Instead of name calling, this is more solution driven conversation. It may hurt the persons feelings a bit, since it is authentic, but it isn’t MEANT to hurt their feelings. And if the person is mature enough, they will see it as that. As they are just facts, not an attack on the other person. And you care about them enough to present them in plain sight. Assertive communication is the most empathetic form of communication as you are brave enough to show the person your true colors. Not trying to put a mask on and let them see things through rose colored glasses. The delivery is fast and factual. WHEN YOU – This is where we paint out a specific episode of something that happened, the incident that we want to talk about. I FEEL or FELT – This is when you be vulnerable and tell them exactly how you feel. Don’t worry about looking weak here. Be honest. NEXT TIME CAN YOU PLEASE – This is where you phrase how you want the other to react if and when a similar situation comes up in the future. When you didn’t answer my phone call after I called 3 times, once per hour. I felt angry because I was worried about you and felt like you were ignoring me. Next time can you send me a text to let me know you are OK? When it comes down to it, eye contact can either make or break the way we communicate. A great article talks about eye contact and assertiveness. It talks about how we need to start by keeping good eye contact with the person to show that you are not afraid of dealing with this individual in an assertive manner. Assertive people use a steady gaze, looking away occasionally but not long enough to ensure that you are in tune with what that person is saying and what you are trying to assertively communicate. They smile but not automatically and fake. They hold a relaxed but firm position with their face. We can practice paying attention to where our eyes flow along with how often we blink when we are speaking with people. This will keep us conscious of how we are using our eyes during eye contact. Which is one of the most evident senses one can use to either portray that they are being assertive or not. Look at a persons eyes long enough for you to register what color their eyes and before glancing away. Draw an upside down imaginary triangle on the persons face that you are speaking to around their face, eyes and mouth. And while you are speaking, shift your view around this triangle every 5 or so seconds. This makes you seem truly engrossed and entangled in what the person you are talking to is saying. Start slow by only working on maintaining good eye contact when you are the listener. That way you don’t have to actively think about what you are going to say next. Then as you get more comfortable with making this passive style of eye contact, you can work on making good eye contact as you speak to a person. Also, listen to non verbal cues along with your intuition. They will both tell you when it is time to keep a steady gaze, along with when it is time to look away. As you may be intimidating the person too much or coming off as too intense. Which can affect you being assertive and make you look like you are trying to dominate or are to aggressive in your approach. in order to exercise assertive communication, we need to keep our cool. When we lose our cool, we lose our ability to effectively communicate. It is also showing that we are not grounded in our beliefs and opinions of what we are communicating about. Often times when we are first learning to be assertive, it can be exciting and nerve racking. But doing your best to stay calm will pay off in how assertive you come off. This means both being calm in your speech and your actions. Which starts with a calm mind. Stay composed as best as possible. Otherwise we can spin out of control with our emotions, looking more childish then assertive. Often times we think what we have to say doesn’t really matter or people won’t care. But in order to be assertive and display high levels of self esteem, we need to know how much our opinion matters and not play it down. Don’t be concerned if people won’t care or act like what you are saying is meaningful to them. By being assertive you give them that option. They will sense that what you are saying is meaningful to you and either respond accordingly. Or not give you the respect that you have for yourself. in which case you know exactly where you stand with that person and can start moving them out of your life if need be. When we start to communicate in an assertive manner, we need to expect that it is going to come back to us in the exact form. So when people start being assertive with you, take it as a good sign that you are bringing your authenticity to how you communicate. Don’t get on the defense. This will allow you to start building assertive communication with people wherever you go. And giving them permission to be assertive with you. Never take it as a personal attack See it as them respecting you enough to be direct. Because any other style of communication is lack of respect in a sense. Assertive communication is not about deciding for others how they are to feel about what you are communicating. It is simply stating, in black and white terms, what is on your mind and allowing them the courtesy to translate it how they will. In order for us to be assertive in how we communicate with others, we need to be excellent listeners. Because the assertive conversation doesn’t stop after we have said our side. We need to allow the other person to assert themselves back to us and then process what they said so that we can communicate how we feel assertively off of what they had to say. Again it is about having the respect for ourselves to give it to people straight and giving them the same respect. By being a good listener, we can properly formulate assertive responses to what people are saying to us. This is one of the most powerful tips to keep conversations assertive for their entire life of the conversation. Hold your back straight and your head up. Do not slouch or hunch your shoulders. Spread your weight evenly on both legs. Do your best to be at the same physical height as the person you are talking to. Even if you have to stand when they are seated or sit down when they are sitting. Just get on their level. Do not shuffle around. For ladies, do not hide your face behind your hair. For both men and women, do not put your hand over your mouth or stand in an off balance stance. Also do not put your hand around your neck or cross your arms or legs. This is showing that you are uncomfortable and closed off. So there you are my friends. Tips for how to be more assertive at work and in your personal and professional life. You can use these tips in any realm of your existence to be more assertive. I hope you enjoyed the article and gained value from it. I would love to hear what you think and what your favorite tip was. And especially if you have anything to add!